Lots of animals make an appearance in our little corner of the woods. 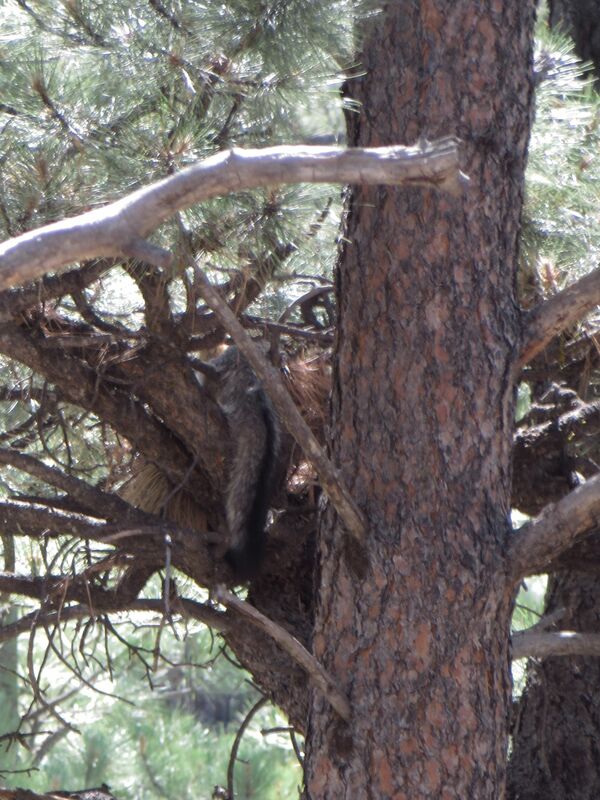 We routinely have elk, deer, jackrabbits, Abert squirrels, chipmunks, ground squirrels and even had a porcupine or two. 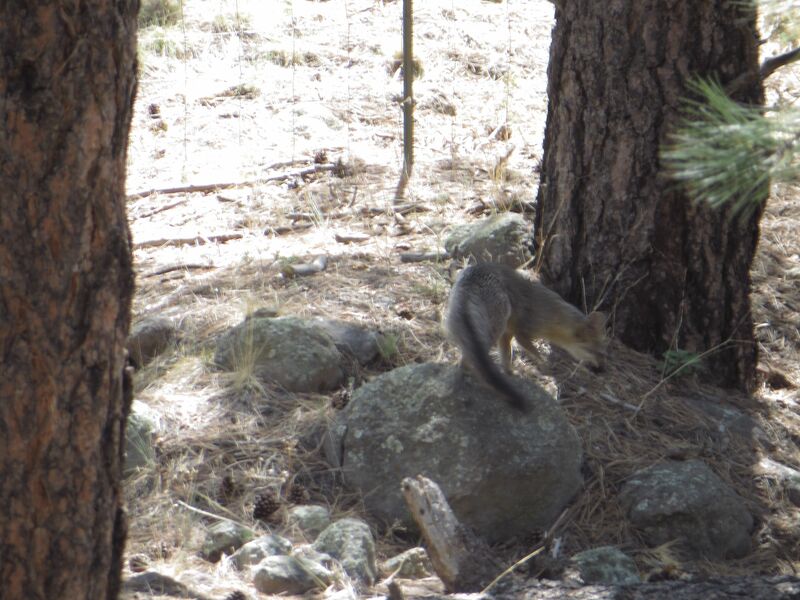 We have been visited by black bears, coyotes and a mountain lion. 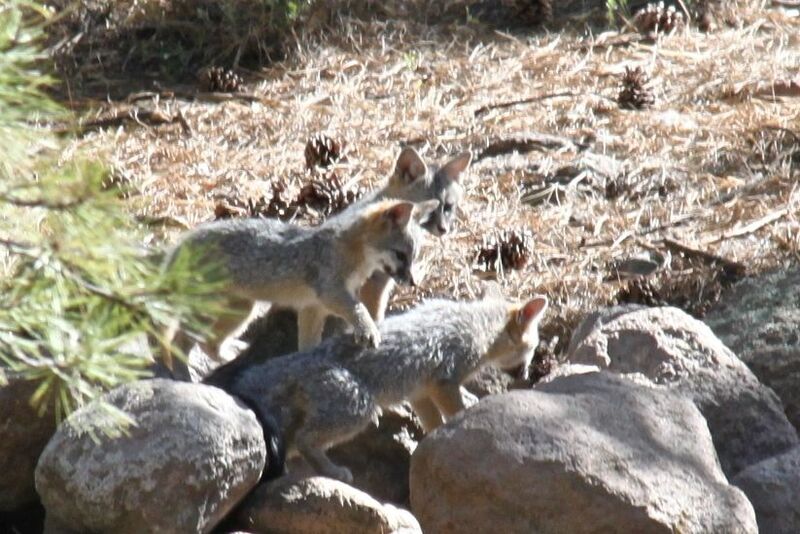 Lately we have been keeping up with our newest neighbors, the fox family. 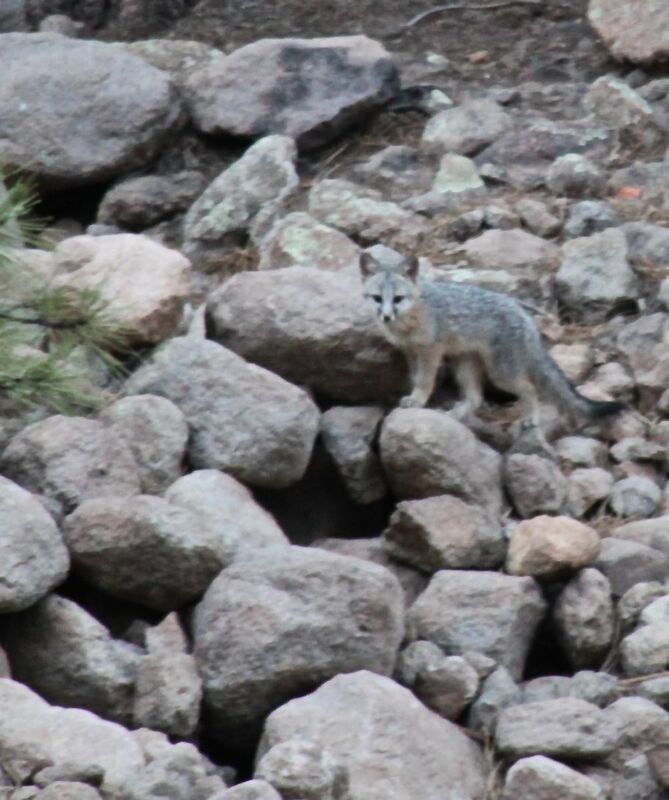 Now that the kits are out and about, we see them daytime and evening. I’m sure they are out at night, as well. The babies have been learning how to climb trees. 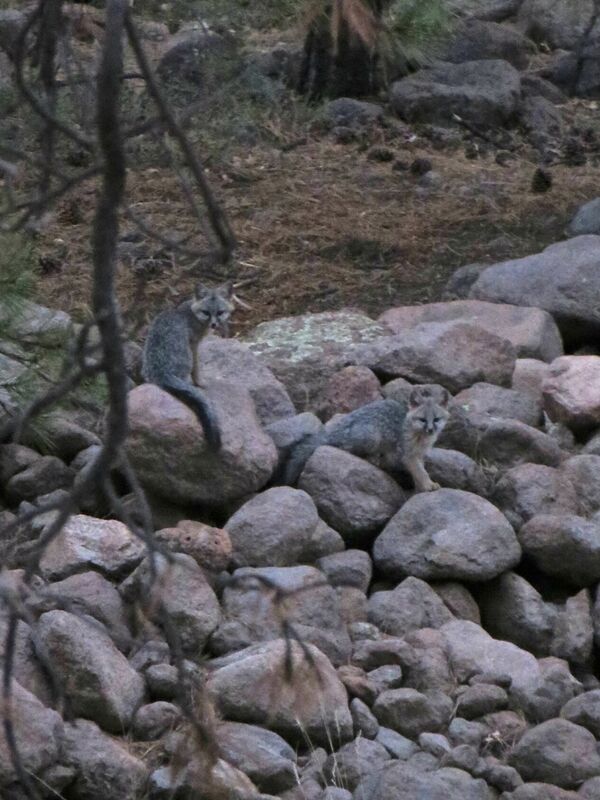 There are only two kinds of foxes that climb trees, and these Gray Foxes are one of the two. Many times a day the crows alert us to the movements of the foxes. Whether crossing our neighbor’s yard, or moving around in ours, the crows chase the foxes and make quite a racket. We live on two and a half acres and the farthest corner of our land is almost inaccessible because it is so rocky. This is where the den is located. For many years, ground squirrels, skunks, and other tunnel-making animals have lived in this old rock quarry. At some point last year, these foxes took up residence. 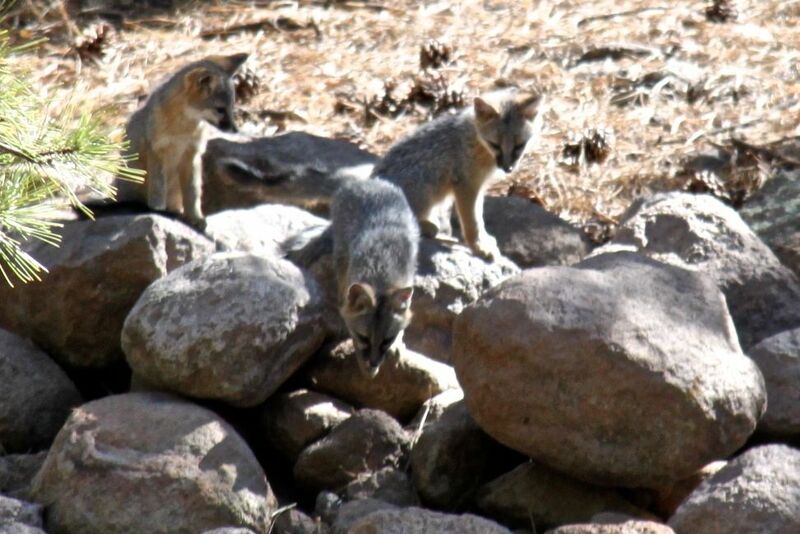 We didn’t notice them until the kits were old enough to be outside of the den, and the whole family began sitting out in the sun for extended periods of time. Now that we are alerted regularly by the crow alarm, we have been taking time out to sit and watch quietly as they go about their day. A member of the Crow Alert System on duty. In the evening the foxes eyes are open wide when they come out of the den. Frequently they watch us watching them. They remind me of cats in some behaviors. The adventurous baby is off on an explore. The crows have been chasing this adult all around the yard. The other adult has climbed a nearby tree. He makes a decision and moves quickly. 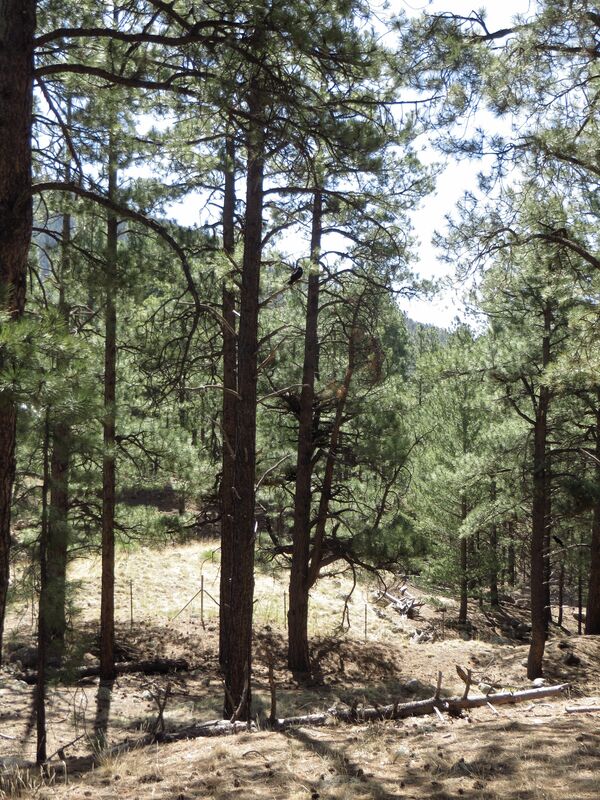 Clearly an experienced climber, he scales this tall Ponderosa effortlessly. He coolly checks to see if we are still watching. 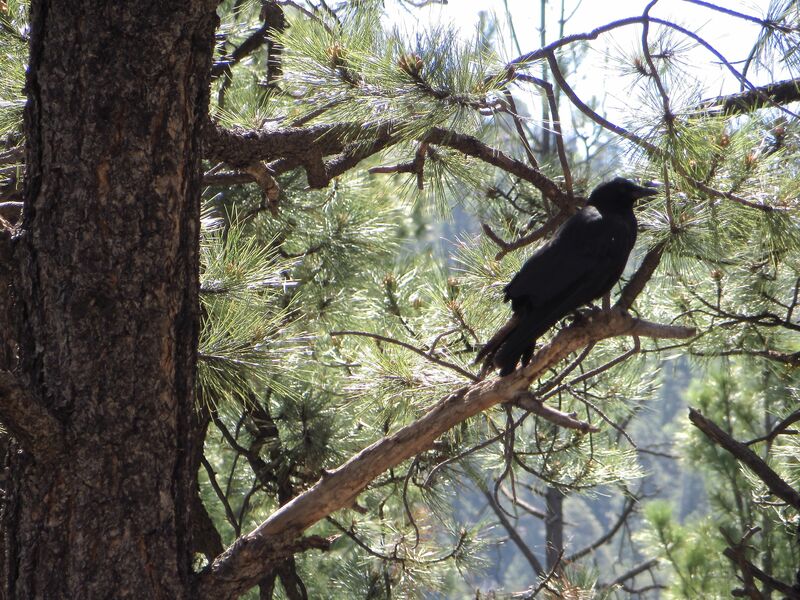 In the photo below, you can see the tangled branches about 20 feet above the ground on the right of the tree where he was perched in this photo. 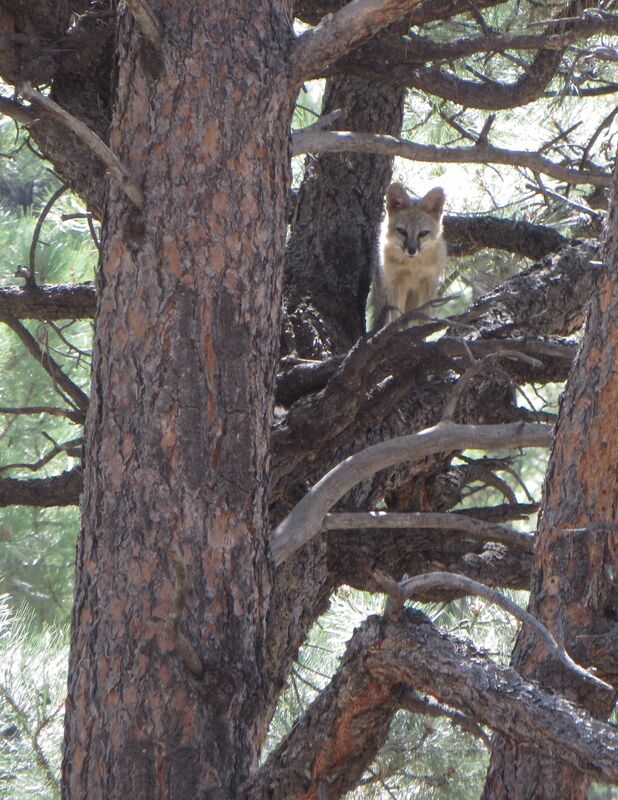 The two adult foxes are in this pine tree. This old tree has witches brooms of branches from old infestations of dwarf mistletoe. These make great nesting spots for birds. The crow in the nearer tree was silent but clearly concerned. 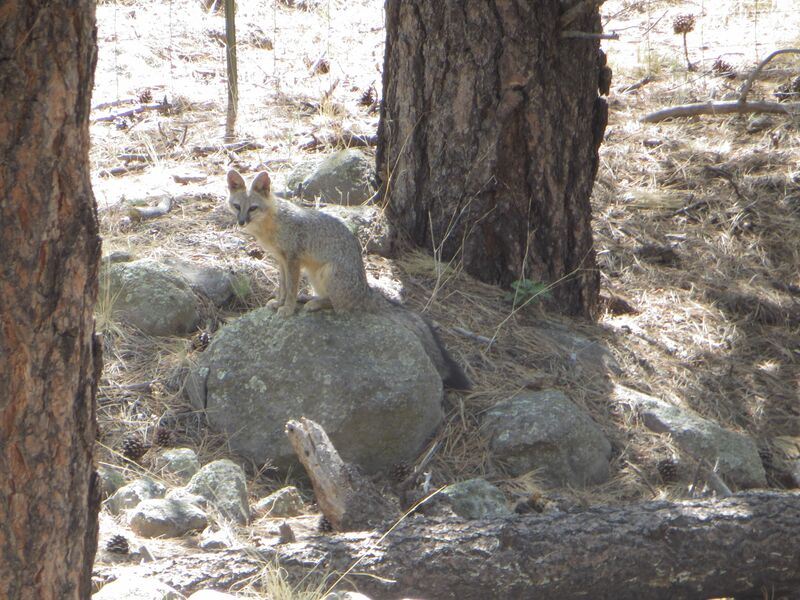 This entry was posted in Arizona and tagged Arizona, Crow, Gray Fox, Photography. What fantastic photos of these cuties. Thank you for sharing. Loved them. Thanks, Sue, I feel so fortunate to be able to watch them so closely. Oh my goodness yes what a treat! I was delighted when we had a wild bunny under our porch. Can’t imagine the thrill of baby foxes. Oh yes, bunnies are so very cute. We have a huge jackrabbit who runs through our yard, but I never seem to have the camera at the right moment. What beautiful animals! You are very lucky to be able to see them up close. 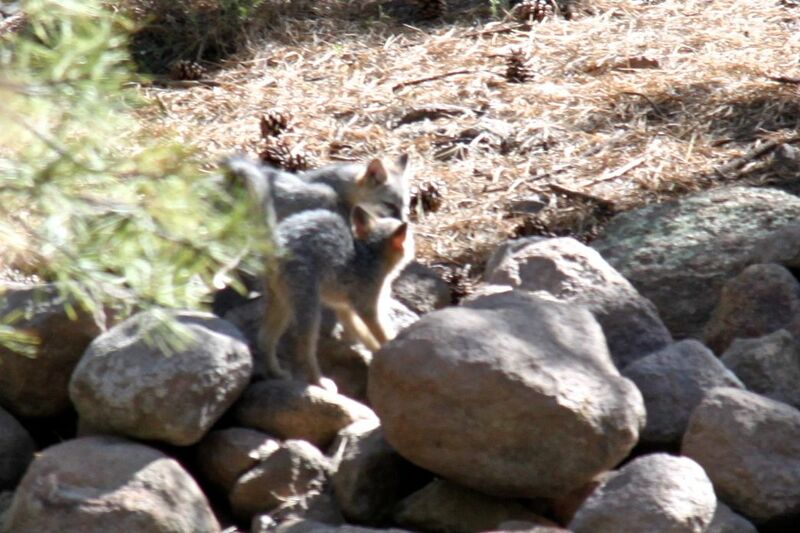 Once in awhile we catch a brief and blurry glimpse of one of our red foxes and it makes our day. To have the little ones has been a treat. Now they are bigger and must be roaming a bigger area because we see them less. Still really cool.